A Mercury Grand Marquis slammed into my car at a stoplight, propelling mine into a Pontiac Sunfire. The red Sunfire gave my car a wet kiss. I was wearing my seat belt and that, along with the seat headrest, ensured I was properly supported for the unexpected rough ride. The car’s rear crumple zone absorbed the energy of the crash, and helped ensure that no one in any of the cars was injured. Physics Lesson #1: The seat belt held me in position as the car lurched forward, ensuring that the seat applied a more distributed force across my body to accelerate me forward during the initial impact. When my car struck the car in front of me, my body’s inertia sent me flying forward, but the seat belt provided the necessary restraining force to keep me from striking the steering wheel and dashboard. In a worse crash, the seat belt would stretch and the increase in stopping time would lower the force on my body while the belt surface would distribute it more evenly. In a severe crash at the correct angle, the air bag would rapidly inflate and increase the stopping time further and distribute the force across a larger area, both factors reducing the pressure on my body. Physics Lesson #2: I keep my car headrest high and positioned behind the back of my skull, not merely behind my neck. That ensured my head was properly supported as I was propelled forward, preventing whiplash. 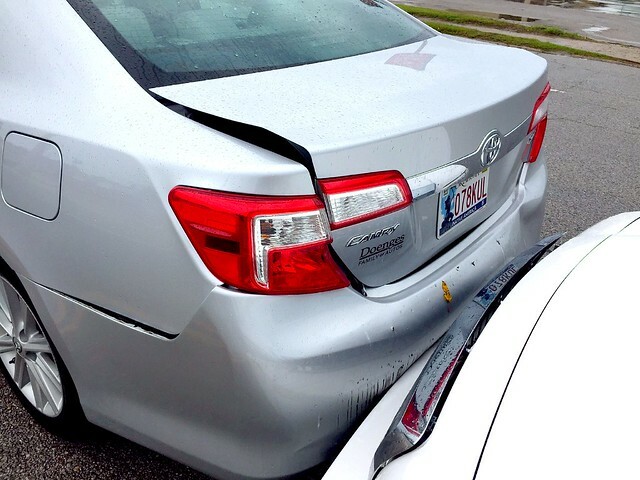 Physics Lesson #3: The over $4,000 in damage to the rear of the car as it crumpled helped reduce injuries. The kinetic energy of the car behind me had to be conserved, and the bumper and crumpling metal parts of the trunk converted that energy into broken and stretched chemical bonds and heat, rather than passing it along to my body and the rest of the car as kinetic energy. Thankfully the person responsible for the crash was insured, apologetic, responsible, and friendly, as were I and the person in the car in front of me. A helpful and polite police officer (and BHS graduate) issued the necessary citation for inattentive driving to the person behind me and gave all three of us handy information for our insurance claims. 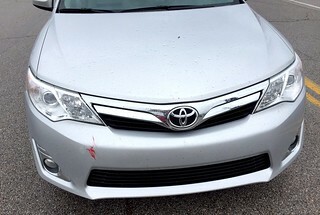 I spent some time on the phone with State Farm making a claim on the policy of the person responsible, and got an estimate from Coachworks, my preferred local body shop. They’ll fix up my car in a couple of weeks, with me driving a rental car provided by the insurance company during the repairs. The folks I dealt with throughout the day commented on my positive attitude about the damage to my car, which I purchased new less than a year ago. Human Lesson #1: We all make mistakes, and no one benefits from someone pitching a fit over a non-injury car accident. Human Lesson #2: Being responsible about having good car insurance and owning up to your mistakes makes everyone’s life much easier. Human Lesson #3: People are grateful when you are positive and pleasant in your interactions with them, even when you have been greatly inconvenienced. 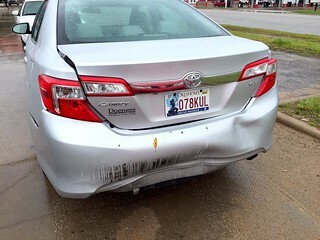 Wendy and I are booked for a week away in Arkansas, and we’ll still be taking my car, even with its crumpled rear end. Her car has a CHECK ENGINE issue her mechanic will work to resolve when we return. 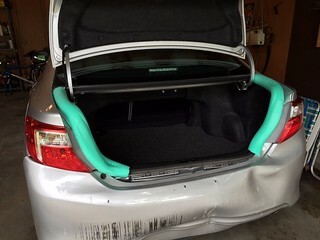 Our region of the country has had heavy rain for a few weeks, so I knew we needed to do something about the gap in the Camry’s trunk lid. Thankfully the latch still works fine, and Wendy had the clever idea of splitting one of our Funnoodle lake floaters to turn it into extra-thick weatherstripping for the trunk lid. It worked well! After we return from Arkansas I have to lead contract bargaining with the district, build new district and high school websites, and get my car repaired. Looks like a busy June ahead. This entry was posted in photos, random. Bookmark the permalink.